CNN Philippines' Ruth Cabal moderates a panel discussion with Ms. Emmeline Verzosa, Executive Director, Philippine Commission on Women (PCW); UNFPA Country Representative Klaus Beck; Dr. Juan Antonio A. Perez III Executive Director, POPCOM; and Ms. Leah Barbia, Officer in Charge, Gender Equality and Women’s Human Rights Center Commission on Human Rights. Every year, UNFPA, the United Nations Population Fund, publishes a global report, called the “State of the World Population”, that tackles pressing development issues of the day. Today, UNFPA launches the 2017 report that looks at inequality and inclusiveness in development. With the theme, “Worlds Apart: Reproductive health and rights in an age of inequality,” the report makes the case that income inequality is in and of itself a serious problem that policymakers must to rectify, but beyond this, other forms of inequality also deserve urgent attention. Indeed, women and girls are living worlds apart from each other as well as from men and boys, in terms of access to healthcare and opportunities for education, employment, and political participation. In today’s world, people are living in a widening economic divide, with the rich growing richer and the poor stay poor. Right now, the combined wealth of the world’s 2,473 billionaires exceeds $7.7 trillion, equivalent to the combined gross domestic product of four-fifths of the world’s countries in 2015. While some privileged families budget for hundreds of millions of dollars, many hundreds of millions of families barely scrape by on a budget of less than $1.25 a day. The gap between the rich and the poor is not only unfair, it is a risk to people, especially women and girls, the marginalized and the vulnerable, as it breeds other inequalities in health, education, employment and socio-political participation. It is also a risk to economies, to nations and to communities. UNFPA Country Representative Klaus Beck presents the 2017 State of the World Population Report “Worlds Apart: Reproductive Health and Rights in an Age of Inequality”. Unfortunately, these disparities are not closing fast enough. In recognition of this, 193 countries affirmed to adopt the 2030 Agenda for Sustainable Development built on a foundation of equality, inclusiveness and universal enjoyment of rights. This agenda identifies poverty as the primary global challenge and calls for freeing the world from this tyranny, leaving no one behind. In reality, economic disparities are only one part of the inequality story. Many other social, political and institutional dimensions feed on each other, and together block the hope for progress among people on the margins, especially women and girls. Inequalities in sexual and reproductive health and rights are intertwined with gender inequality. Both deserve urgent attention and demand more action. Without such action, many women and girls will remain caught in a vicious cycle of poverty, diminished capabilities, unfulfilled human rights and unrealized potential – especially in developing countries and especially among girls. In 68 countries across the world, gender gaps have widened between 2015 and 2016. Exclusion and inequalities in opportunities can have profound consequences on women and girls now and in the future. Take the case of a young girl as portrayed in the report. She was born to a poor family, in a rural community, in a poor country. As her life unfolds, she may go to school, but probably far fewer in years than boys her age. She may have to stop schooling because she gets married young or is expected to care for her younger siblings. As she becomes an adolescent, she may know how to perform household tasks and cultivate the farm, but she will find it challenging to join the paid labor force. She is more likely to stay home and start bearing a child as a teenager. Giving birth at an early age is already risky and the dangers will be compounded because her community lacks quality maternal health services. Looking ahead, she can expect that some of the disparities she suffers will be transmitted to her children, particularly her daughters. At some point, she may get a glimpse of a better world, and she will wonder why she has so little, and so little opportunity for gaining anything more. 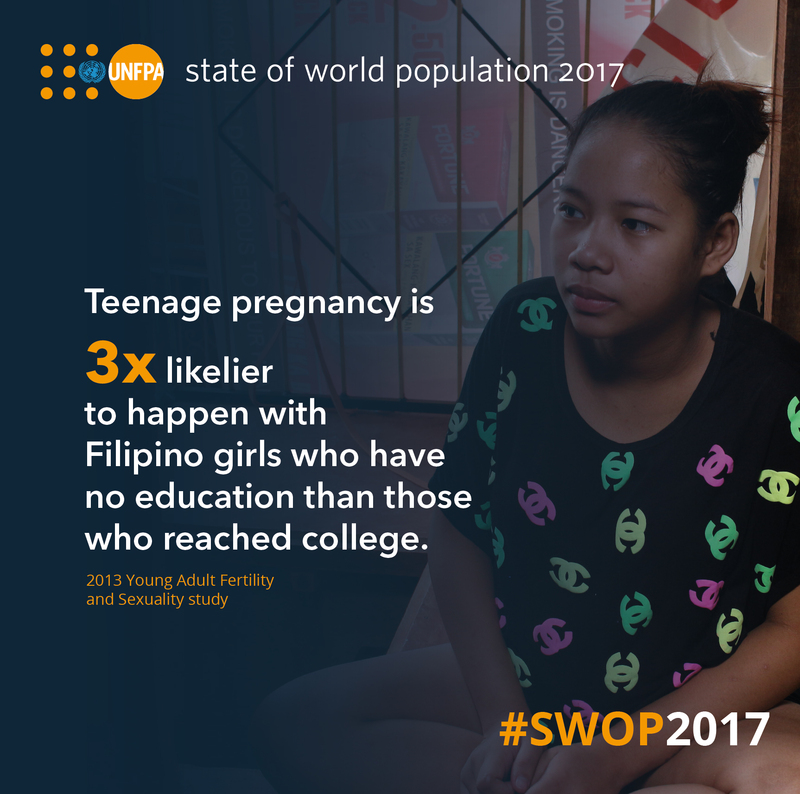 Teenage pregnancy is three times likelier to happen with Filipino girls who have no education than those who reached college. Source: 2013 Young Adult Fertility and Sexuality study. Stopping the downward spiral of inequality will require a vision for inclusive societies and shared prosperity, guided in principles of human rights. Actions on multiple fronts must tackle all forms of inequality, social and economic, and both the consequences and root causes. Some countries have shown the way forward – for example, by including sexual and reproductive health services in broader objectives to achieve universal access to health. Inclusive societies are a conscious, achievable choice, built through supportive public policies and laws, services and social norms. We all gain when human rights and dignity are universally upheld, with no exception and with no one left behind. One measure of access to sexual and reproductive health services is the extent to which a woman who wants to use a modern method of contraception has access to it. A study on unmet demand for contraception shows that in most of West and Central Africa, women from the richest 20% of households are more than twice as likely to have their demand satisfied as women from the poorest 20% of households. In the Philippines, unmet need for family planning among the poorest quintile is 4 percentage points higher than the unmet need among the richest quintile. Access to family planning services is a foundational element not just of reproductive health, but of social and economic equality, since unintended pregnancy constrains opportunities that women would otherwise have for education and economic advancement. The report cites a strong positive relationship between household wealth and skilled birth attendance. In developing countries, the poorest 20% of women are far more likely to give birth without assistance than women in the top wealth quintile – none more pronounced than in most countries of Africa as well as in Asia and the Pacific. The ways in which inequalities in women’s health and rights intersect with economic inequality are complex and often not linear, but the impact is clear. The poorest and least educated women have the least access to sexual and reproductive health, are least able to exercise their reproductive rights and are most likely to be unemployed or under-employed and earn less than men. Gender-unequal norms not only influence whether a woman enters the labor forces but can also dictate which types of jobs she may pursue, determine how much she will be paid and hinder her advancement in the workplace. Unsurprisingly, women’s labor force participation in high-fertility, least developed regions remains low, as evidenced in such regions as in South Asia and sub-Saharan Africa where women’s entry into the paid labor force are at a low of 20% and 22% respectively. For women everywhere, pregnancy and child-rearing can mean exclusion from the labor force or lower earnings. The challenges are even greater for women who lack the means to decide whether, when or how often they become parents. 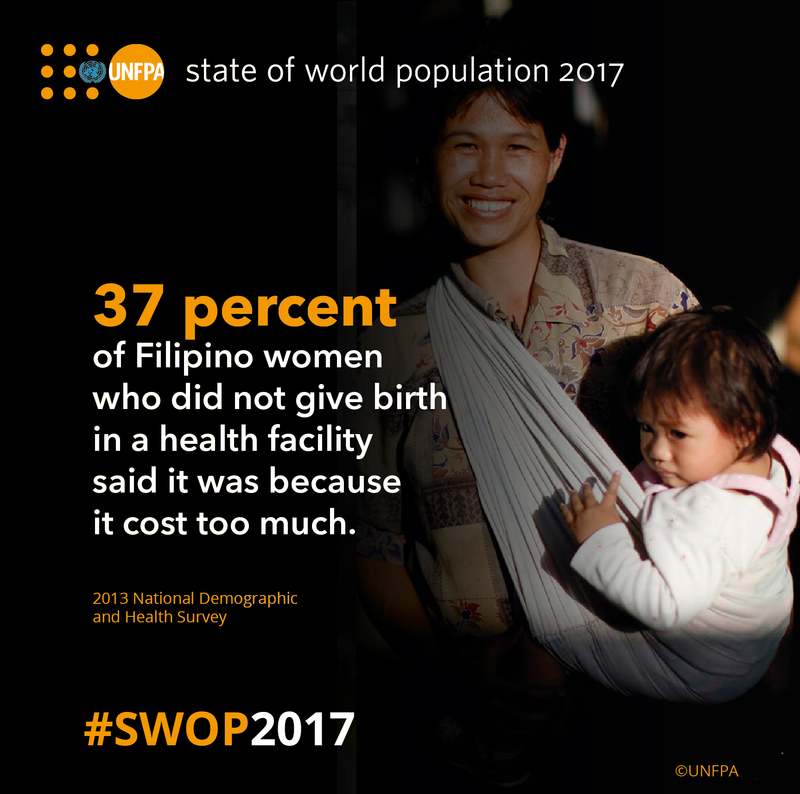 37 percent of Filipino women who did not give birth in a health facility said it was because it cost too much. Source: 2013 National Demographic and Health Survey. Majority of people agree that women and men should have equal access to a university education. But in the area of employment, most believe that when jobs are scarce men should have priority over women. This negative attitude about women’s equality in the labor force poses a serious threat to women and their desire to compete in equal footing with men who are equally competent for the job. More than inequalities in access to reproductive health services, discrimination against women and girls is entrenched in many social institutions. In countries with high levels of discrimination, one in three girls is married by age 19. Women’s rights to own and control land and other resources, and to access public space are extremely limited. Under these situations, there is high prevalence of domestic violence. And in many countries, laws – or the absence of them – reinforce these dire situations. In a review of 143 countries, 128 had at least one legal obstacle to women’s participation in certain economic opportunities. In another review of 173 countries, the World Bank reports that 46 of these countries had no laws on domestic violence, and 41 had no laws pertaining to sexual harassment. Laws protecting women from economic violence are rare. Economic violence occurs when a woman is deprived of her economic means because her partner either controls the economic resources or prevents the woman from having or keeping a job. Once in the paid labor force, women find themselves earning less than men for the same types of work. This phenomenon is called the gender wage gap, or the percentage shortfall in the average age of women relative to the average age of men. The ILO reports that globally, this gap stands at 23% - meaning that women earn 77% of what men earn. Progress in narrowing this gap is rather slow and ILO estimate that it will take more than 70 years before the gender wage gap is closed. Women’s lower earnings are a product of the educational and occupational biases that unnecessarily favor men. Subtle or overt pressure from, or discrimination by teachers can lead girls to forego or be excluded from advanced science and mathematics courses, limiting their future occupational choices. In high-income countries, the major sources of employment for women are the health and education sectors, which employ more than 50% of all women in the labor market. In low and lower-middle-income countries, agriculture remains the most important sources of employment – work that is poorly remunerated, seasonal and less secure. In addition, women do on average 2.5 times more household work than men. This all the more limits women’s opportunities to engage in paid employment. 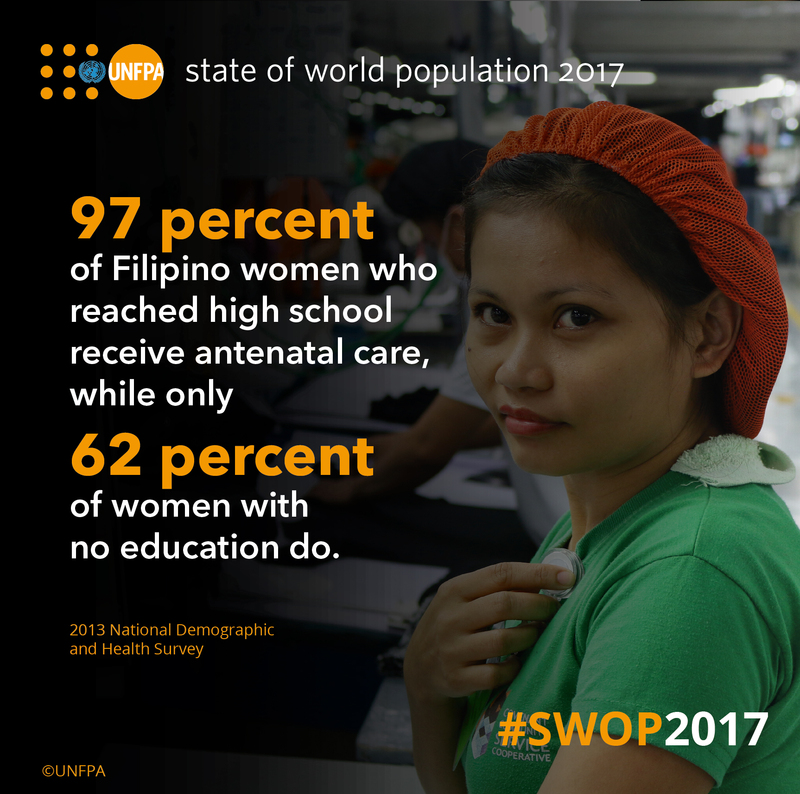 97 percent of Filipino women who reached high school receive antenatal care, while only 62 percent of women with no education do. Source: 2013 National Demographic and Health Survey. We are also seeing women indirectly being penalized for having children. They experience the so-called motherhood penalty. Employers may justify paying women less because of a wrong perception that women lack commitment to their jobs at a time when they just got married or have children at home. Some employers even pass potential mothers over for promotion because of the anticipation of a pregnancy-related leave. Workplace discrimination against pregnant women and workers with family responsibilities is a violation of labour rights. Maternity and paternity leaves are an important mandatory provision to address pregnancy risks and to give time for parents to take care of their children. Unfortunately, some countries and some companies do not provide the standard maternity and paternity leave periods – or do not provide them at all. Again, this is a violation of labor rights. In the context of an uneven distribution of responsibilities and obligations for care, women’s ability to enter the workforce often depends on finding affordable, accessible and flexible day care for their children, which in many cases is difficult to find. The effect of education in reducing adolescent pregnancy has been documented. The longer a girl stays in school, the less likely she is to be married as a child or to become pregnant. If all girls in sub-Saharan Africa and South and West Asia received secondary education, child marriage would have been reduced by 64%, early births would have decreased by 59% and total fertility rate would have been down by 42%. What then are the social costs of inequality? In the developing world, 43% of pregnancies are unplanned. And this leads to millions of unintended pregnancies, abortions, miscarriages and still births. Unintended pregnancies are linked to increasing poverty and reduced prospect for women’s economic mobility. They also increase the risk of maternal mortality. Despite reductions in maternal deaths worldwide, the maternal mortality ratio in the least developed countries remains at 436 deaths per 100,000 livebirths, compared with 12 deaths per 100,000 births in developed countries. The risk of maternal deaths for mothers under age 15 in low- and middle-income countries is double that for older women. One thing is clear: the key towards reducing inequality is by reaching the furthest behind first, and the report points to the Programme of Action of the International Conference on Population and Development which calls for, and I quote, “sustained economic growth in the context of sustainable development; education, especially for girls; gender equity and equality; infant, child and maternal mortality reduction; and the provision of universal access to reproductive health services including family planning and sexual health.” (end of quote). When nations of the world came together in 2015 to chart the course towards sustainable development in the next 15 years, they committed to ending poverty and hunger everywhere, to combatting inequalities within and among nations, and to building societies that leave no one behind. 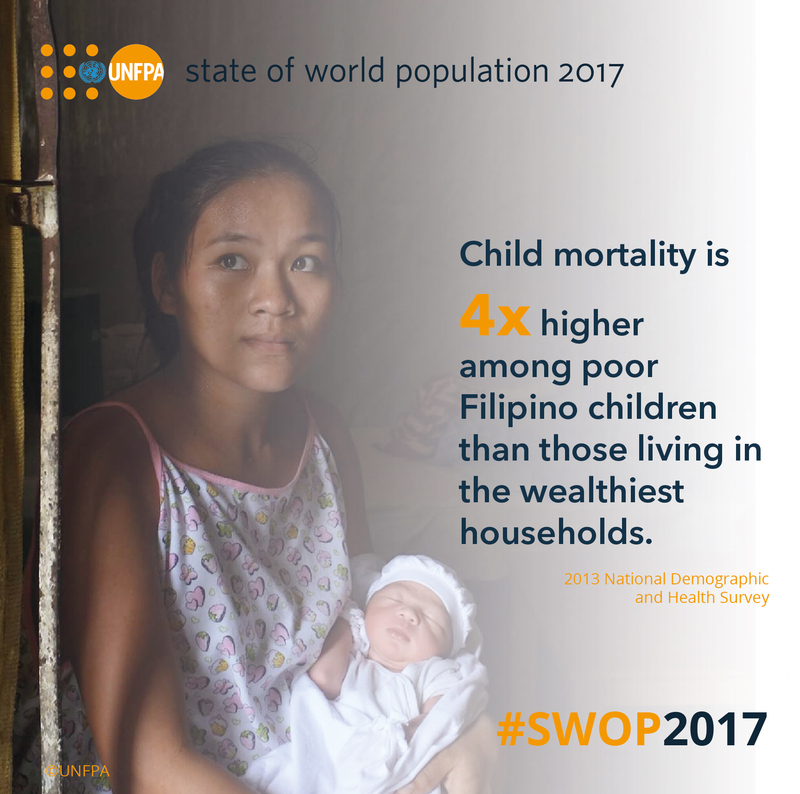 Child mortality is four times higher among poor Filipino children than those living in the wealthiest households. Source: 2013 National Demographic and Health Survey. Reducing inequality in health, particularly reproductive health, can have a potential impact on economies through a demographic dividend. The demographic dividend sets in motion a virtuous cycle in which enhancement of human capabilities – through interventions in health and nutrition, education and employment – accelerates economic growth which in turn increase the potential for families and governments to invest additional resources in building the capabilities of the next generations. And this can only be possible if everyone – especially the youth, the vulnerable and marginalized – are reached out by these investments. But equality is multi-dimensional, and one path to equality is universal health care. Health care that is universal is care that is accessible without resulting in financial hardships. As the World Bank report states, and I quote, “Reducing health inequalities is not only fair, it also promotes improvements in the well-being of the poorest and enables their accumulation of human capital” (end of quote). The benefits of improved sexual and reproductive health care for all extend beyond health. For societies, there will be increases in growth of GDP and GDP per capita, increases in number of working age adults relative to dependent children, and decreases in demand for public expenditure in education, housing and sanitation. For families and household, improved sexual and reproductive health care results in increased savings and household assets, reduced number of children who become orphans and increased resources for children, especially for schooling. For women, there will be an increase in the ability to continue education, in production and in earnings, and will promote autonomy, self-esteem and gender equity. In conclusion, the report emphasizes that the multidimensional and persistent nature of inequality means that there is no single or easy way to close gaps between women and men, rich and poor, rural and urban, and the healthy and those who have no access to care. As the Lancet Commission noted in its seminal report on adolescent health and well-being, and I quote, “the most powerful actions are inter-sectoral, multilevel and multi-component” (end of quote). Still, progress is possible, without addressing every dimension of inequality at the same time. Progress in one dimension can enable progress in others. Even small steps can open the path to great strides. Based on evidence of what works around the world, these 10 actions can help realize the quest for a more equal world. It requires all countries and all citizens to come together and tear down the inequalities in the lives of girls and women so that, in the end, they will not live worlds apart, but are part of a world where they too enjoy a life of prosperity, progress, and equality. A world, where no one is left behind.